Larger lathes branded Lorch, Schmidt & Co. Founded in 1885 - and trading under the names "F.Lorch", "L.S.& Co." and "Lorch, Schmidt & Co." - Lorch was a German precision machine-tool company finally driven out of business when, in November 1976, the merchant bank supporting it withdrew support. Until then Lorch had enjoyed a long and illustrious history as makers of precision lathes, high-quality production machinery for watch and clock making, specialist watch-repair tools, machines for the optical trade and collets - the latter widely used by other makers needing precision work-holding capabilities. 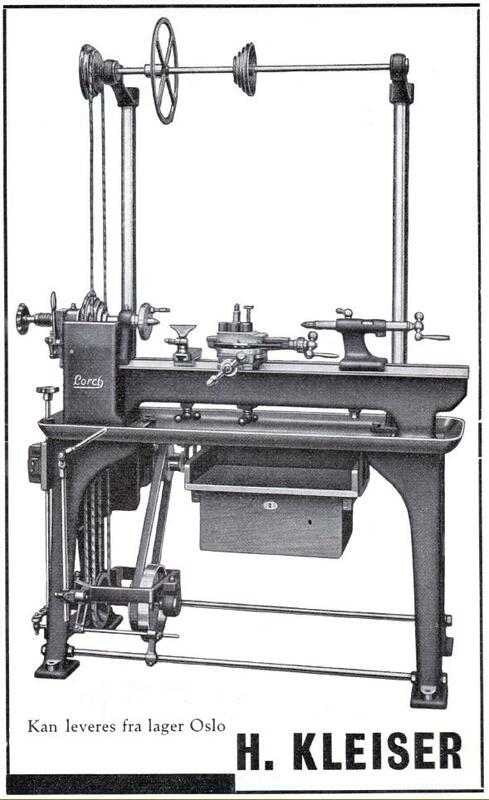 Lorch never made large industrial-size machines, limiting their range to lathes of no more than 6-inches (150 mm) centre height and with the bulk of their production being smaller bench precision and watchmakers' types - a well known and long-lasting example being the "Geneva-pattern" Triumph". Also produced, though in very limited numbers, were versions of the heavier plain-turning lathes adapted as horizontal milling machines - a ploy also adopted by some American makers of similar lathes such as Ames, Cataract, Pratt & Whitney, Stark and Waltham. What the marketing philosophy was in regard to the use of F.Lorch, L.S.& Co. and Lorch, Schmidt & Co." is not known, with seemingly identical lathes being badged simultaneously with different labels and stampings, though after WW2 the use of Lorch, Schmidt & Co. appears to have been abandoned. Over the years each of the three names was given to many different types of machine - from tiny watchmakers' lathes (sold individually and in boxed sets) through small and medium-sized plain-turning bench lathes (not dissimilar to the American Stark and similar makes) to larger backgeared and screwcutting models. The latter type, with centre heights from 4 to 6 inches (100 to 150 mm) were often listed in catalogues under the Lorch Schmidt heading. Although the larger lathes evolved steadily to follow changes introduced by other makers - typically more massive castings, larger headstock spindles and improved bearings running with the ability to taker deeper yet more accurate cuts - the smaller lathes had almost finished their development by 1910..
A comparison with Lorch lathes made in the first decade of the 20th century with those produced in the early 1950s will show surprisingly few changes: apart from some cleaning up of details, larger micrometer dials, built-on countershaft units and integrated electrical switch gear, there was simply no need to alter them, so well had the originals been designed and constructed. However, from the early 1950s, a greater effort was put into modernising the design of the watchmakers' lathes - unfortunately (or happily), the result has been a bewildering variety of types and sizes - sometimes designated only by the particular kind of the compound slide rest, or headstock - or combination of such feature. It was also possible for customers to specify their own particular requirements of collet capacity, lever or screw-feed slide rests, screw, lever or capstan-driven tailstock barrels, thread-cutting or thread-chasing equipment, etc., and so create a unique machine for their particular purposes. With such a plethora of models to choose from identifying a particular Lorch model without access to a range of reference resources can be very difficult and, just to confuse matters further, the factory almost never fitted Type or Model name plates to any of their products--although if you look very carefully its sometimes possible to make out a model stamping at the tailstock end of the bed. Although comparatively rare in the UK - these were very expensive machines when new and usually confined to professional users in experimental and similar workshops - they are relatively common in continental Europe. Greatly sought after not only for their inherent mechanical beauty they are also, even today (because of their superior design and quality of construction) a genuinely useful machine. Some fine restorations have been carried with enthusiast try to collect, as with other similar areas of mechanical interest, the complete accessory range. With such a plethora of models to choose from identifying a particular Lorch model without access to a range of reference material can be very difficult and, just to confuse matters further, the factory almost never fitted Type or Model name plates to any of their products. For convenience, accessories have been divided into older and newer types (Pre and Post 1950) - this does not, however, indicate a significant change at that exact time for many of the items, whether produced in 1920 or 1970, performed exactly the same function with their design evolving only gradually over many decades until the 1950s when certain models, including the Lorch Junior, were made available on self-contained, motorised bench-top bases..
An example of a very late Lorch--the neatly presented and beautifully finished "Junior". This lathe is representative of the Lorch effort to upgrade and better present their range of watchmakers' lathes from the early 1950s onwards. Note the angle table and lapping wheel behind the lathe and the two front-mounted wrist rests.